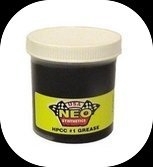 NEO HPCC#1 Grease is a specialty grease for linear and oscillating mechanisms and couplings, such as constant velocity couplings (CV joints) and sealed bearings. It will take heavy shock loads, frequent axial movements, large speed variations, and frequent reversing. It is made with a higher molecular weight synthetic base stock and will withstand extreme temperatures. It has a very strong resistance to water washout in rain or even salt water. NEO HPCC#1 Grease is designed for low oil separation under centrifuging. It is classified as an NLGI#1 ½ Grade grease but will react to the amount of shear loading and will stiffen to a hard #2 grade grease. The grease is designed to “skin over” to create a shell that resists dirt and moisture, but this shell does not in any way detract from the lubricating qualities. For this reason, this is an excellent product for “sealed for life” bearings or large open gears. It is equally at home in dusty climates and very wet locations.